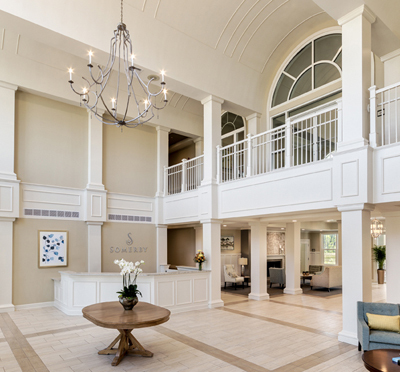 RJTR provided architectural and interior design services for Somerby of Santa Rosa Beach, a senior living community located in the Florida Panhandle for developer Dominion Partners. The design features Mediterranean elements that blend with and complement the vernacular architecture of the surrounding community. This 76 unit, 67,482 SF two-story structure showcases a double-height entry with a barrel vault ceiling and abundant natural light. An array of amenities provides the 52 assisted living units with the physical, social, and recreational opportunities essential to a holistic wellness lifestyle. 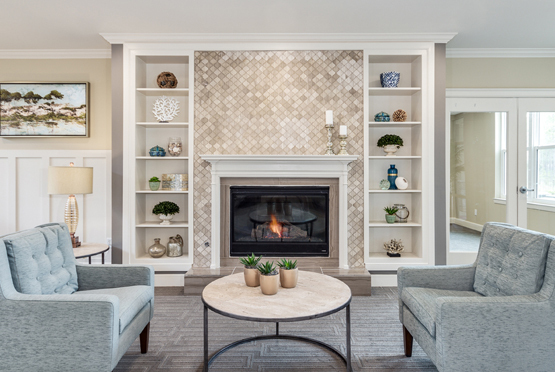 Formal dining space, multiple living areas, a ﬁtness room, and salon are all designed with the resident's quality of life and the staff’s quality of work in mind. A multipurpose room functions as a theater, arts and crafts zone, community meeting room, and occasional dance hall. A dedicated and secure memory care neighborhood for 24 residents includes a separate nutrition center, dining room, activity zones, and adjacent staff areas to support memory care residents. They can also enjoy the outdoors from their covered porch, which adjoins an enclosed garden.